When it comes to generating the necessary amount of traffic to your website, it is imperative to rely on SEO techniques to assist you. In order to generate the most traffic to your website, it is important to follow the rules of SEO and create a variety of keywords to allow you to do so. 1. Optimize the title tags for your content, which are specific to your business and website. This will consist of the title tag being more than 70 characters long and should contain the product keyword and the name of the company. Also, work to keep the title tags as interesting as possible. This can be done by being creative and working to develop tags, which are enjoyable and exciting to read to create SEO methods. 2. Create compelling meta descriptions. 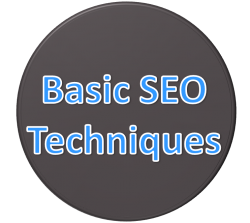 It is important to use the SEO technique that will involve creating page descriptions, which are detailed and informative. The length of the descriptions should be between 150-160 characters in length and should additionally have at least one mention of the keyword in the meta description. 3. Make the best possible use of keywords throughout your web content and any additional online content, which you create as well. When you optimize your written content and add at least two or three percent density of the keywords throughout your content, this will allow you to have a much greater target to reach. It is imperative for any business owner to take the time to create keywords that are most searched for by the online shopper to assist in getting more traffic. 4. Take the time to create internal links in your content. This is ideal to increase the amount of traffic to your site. When you create an internal link from one page to another one, this is certain to allow for more visitors to come back to your business website. 5. Keep the content updated on your website on a regular basis. It is of the utmost importance to take the time to create new content on a regularly. When you work diligently to employ SEO methods in your content, this is certain to allow you to get the biggest amount of visitors to your website and will create the most sales and profit as a result of doing so. There are a number of web owners that will simply create a website and never do anything to it. It can be a challenge to be consistently active and make the right moves for your website on a routine basis, but when you put in the right amount of time and effort, this is certain to pay off for you. Finally, take the time to continually learn a variety of SEO techniques to improve your rankings and create more business. Companies like YPG are dedicated to SEO and can be a great resource as well. SEO is consistently changing and the ability to keep up and follow these changes is certain to result in more effective ways to work to get customers and maintain them. Consider signing up for a number of SEO newsletters to allow you direct access to changes and updates in this area to assist you in your quest for more business. Regular use of these techniques will allow any website to have much more business, which create much more profits for the business.